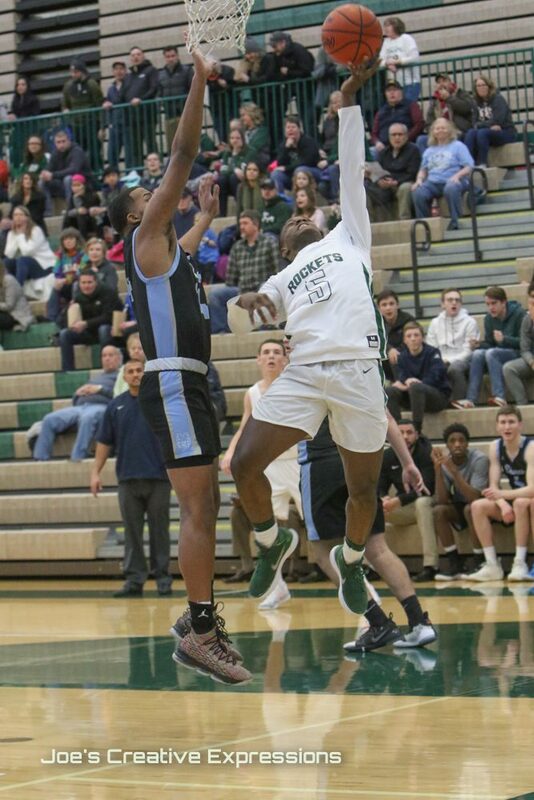 MUSKEGON TOWNSHIP – The Reeths-Puffer-Mona Shores rivalry is not an unfamiliar topic for Rockets boys basketball coach Lance Johnson. It’s just been an unpleasant one, at least until this season. For the past three seasons, since Johnson took over the Reeths-Puffer program, his squads were 0-7 against Mona Shores. But this season his team is on a much different path, and the momentum in the rivalry has swung. 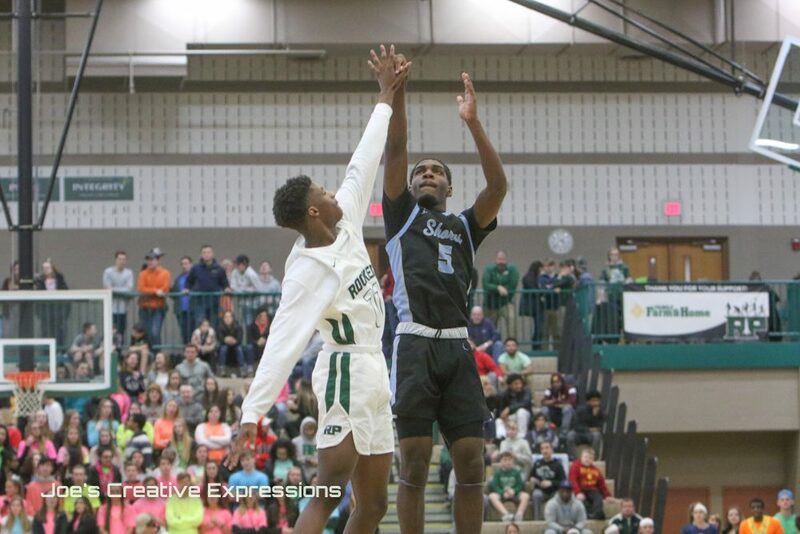 Reeths-Puffer topped the Sailors 56-50 on January 19 in a tight battle. 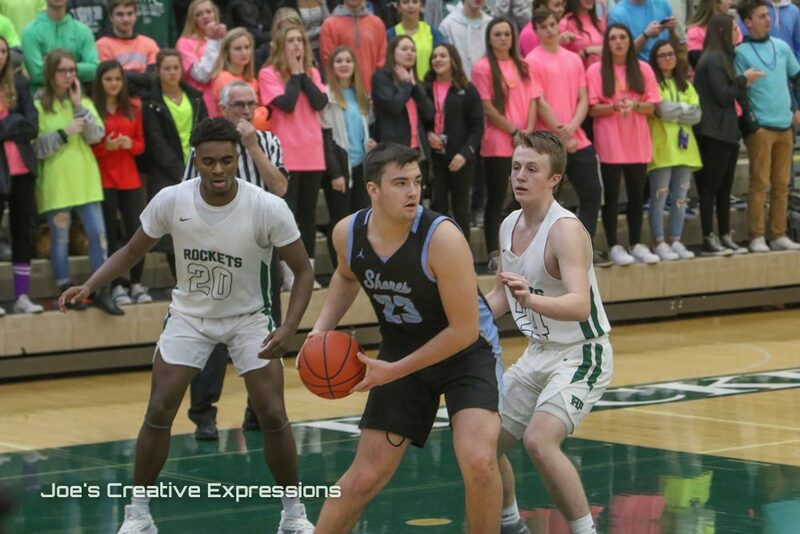 Then on Friday night, the Rockets held off the Sailors for the second time this season with a 59-54 win at home, giving R-P fans even more reason to cheer a very successful season. 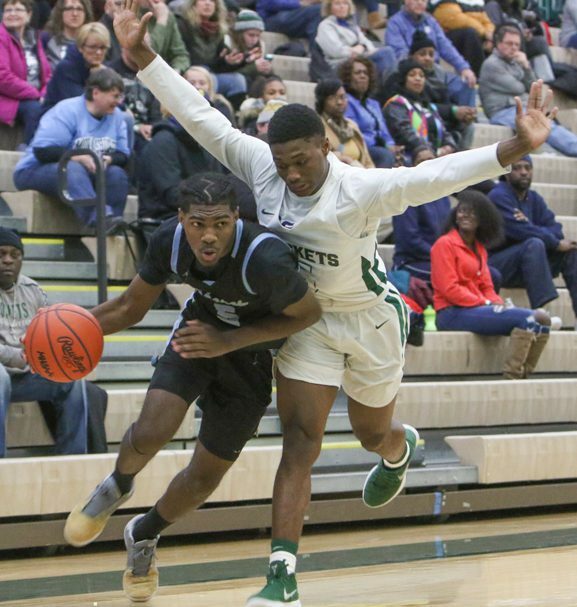 The win was not an easy task for Reeths-Puffer, which had to fight off an incredible second half by Mona Shores’ James Gilbert. The 6-4 senior guard drained seven 3-pointers in the third and fourth quarters and finished with a game-high 29 points. The Rockets also had to shake off a 13-0 first-quarter run by the Sailors, who led 13-7 to start the second quarter, after Reeths-Puffer started the game with a 7-0 run. Reeths-Puffer managed to bounce back before halftime, taking a 24-19 lead into the break. Five different players scored in the second quarter for the Rockets, who managed to settle down in their half court game. The Rockets’ balanced attack was on full display in the second half when seven different players scored. In the third quarter, senior Carter Fulton jumped out of the gate for RP. The 6-2 guard scored the Rockets’ first eight points, back-to-back 3-pointers. 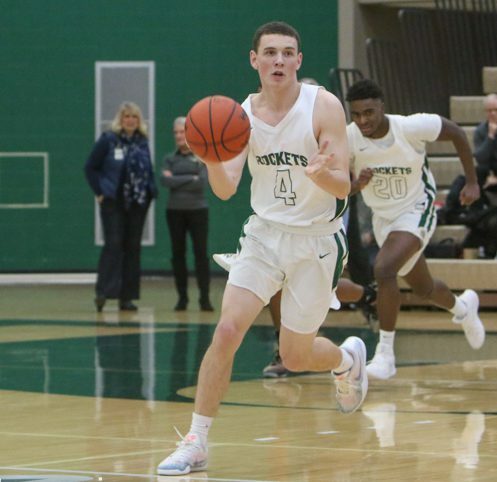 After a Josh Jordan bucket in the post gave Reeths-Puffer a 34-23 lead, the Rockets looked like they were taking complete control of the game. But in stepped Gilbert with a pair of 3-pointers, cutting the Sailors deficit to just 36-31. The Sailors managed to stay close to the Rockets and had 43-36 deficit to start the fourth. Reeths-Puffer started the fourth quarter with a 5-0 run and again looked like it was about to run away with the game. But again, Gilbert stepped in with a pair of 3-pointers that put the Sailors down 48-42 with four minutes left to play. After a back-and forth battle, the Rockets were able to build a 53-46 lead with under two minutes to play. But pesky Gilbert would not let his Sailors fall away. Hitting his sixth shot from behind the arc, Gilbert cut the score to 53-51 with 49 seconds remaining. 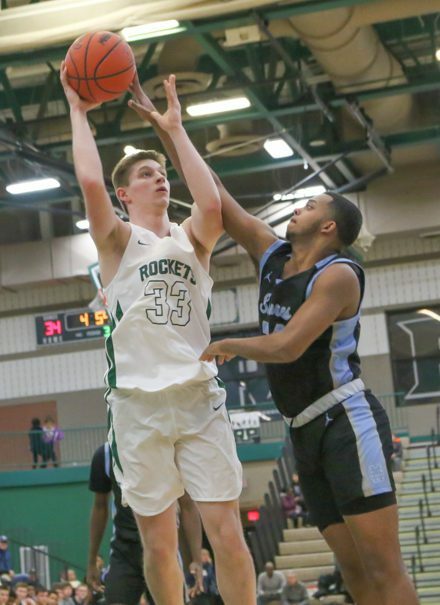 Reeths-Puffer responded with a Gary Humphrey bucket and a pair of free throws from Kaleb Mitchelson, giving the Rockets a 57-51 lead with 11 seconds left. Fans thought that was it for the Sailors, but Gilbert still had juice left in his shot, sinking his final 3-pointer of the night. Mitchelson was able to seal the win with a pair of free-throws with 1.5 seconds leftt. 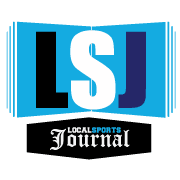 The Rockets were paced by Fulton with 13 points, Jalen Williams scored nine points while Jordan and Mitchelson each had eight points.